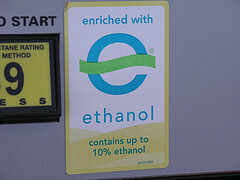 The US corn ethanol industry doesn't need to grow further, because it is already within striking distance of the target set by the government, which also appears to represent the maximum prudent level of output for a fuel source that makes such heavy use of water and fossil energy sources in its production, and that ultimately competes with the consumption of corn as food or feed, here and abroad. In other words, the work of the subsidies and mandates for corn ethanol is complete, and the government has shifted its focus to cellulosic ethanol and other advanced biofuels, which enjoy their own distinct—and more generous—subsidies. It hopes these sources will expand from essentially zero to cover the remaining 21 BGY of the current RFS by 2022. Now, ideally, we'd be having a broader discussion about biofuels policy. There's ample evidence that the ongoing corn- and soy-ethanol frenzy in the United States and Europe has indirectly fostered deforestation and jacked up food prices. A 2008 Science study found that these "first-generation" biofuels produce nearly twice as many greenhouse-gas emissions as gasoline, once you factor in all the indirect land-use effects. Alas, Congress is tilted toward rural and farm interests by design, which means corn ethanol isn't slinking away anytime soon. Still, we could at least start with small steps—there's really no need for these subsidies, which total some $4 billion per year (and will rise to $6.75 billion per year by 2015).